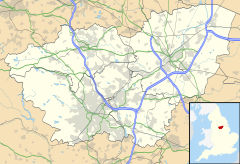 Birdwell is a village in the Metropolitan Borough of Barnsley in South Yorkshire, England and is located approximately 4.5 miles (7 km) south of Barnsley. The village falls within the Rockingham Ward of the Barnsley Metropolitan Council. Neighbouring villages include Worsbrough, Tankersley and Hoyland Common. The A61 (Sheffield Road) passes north-south through the length of Birdwell, and at the southern end is Birdwell Roundabout which is the junction between the M1 motorway at Junction 36 and the A61. The roundabout also marks the start of the Dearne Valley Parkway, a relatively new dual carriageway which links the M1 at Junction 36 to the A1 at Marr (near Doncaster). Birdwell is run under the auspices of Barnsley Metropolitan Borough Council. The origins of the village of Birdwell date back to the time of the English Civil War, around 1642, when the village name is first mentioned. In the years following the Second World War, open cast mining took place on much of the land to the northern end of Birdwell, and in some areas the remains of the quarries can still be found. Much of the land was subsequently restored to agriculture, mainly pasture with a little low key arable production and since the 1970s was owned by a local farming company. A small pocket of woodland called Parkinson Spring survived the mining activity and whilst little is known of its history, the name 'spring' could infer it was coppiced for the production of spring wood. The predominantly ancient woodlands of Miller Hill and Wigfield Wood are thought to be remnants of the once extensive woodland of the Wortley Park estate, an area through which the M1 motorway was subsequently built. Hangmanstone Depot was the site of Allan Finlay's diesel engine export company Hartwood Exports, where a great number of UK buses and other commercial vehicles ended their lives. Birdwell & Hoyland Common railway station, was a railway station on the South Yorkshire Railway's Blackburn Valley Line between Westwood and High Royds. The station was intended to serve Birdwell, Pilley and Hoyland Common, although the original chosen site was moved half a mile nearer towards Barnsley to serve the purposes of the Earl of Wharncliffe who was, at that time, sinking Wharncliffe Silkstone Colliery nearby. This move away made the station less convenient for most of the population. The station was opened in February 1855, the building having an ornate canopy over its entrance and containing a private waiting room for use by the Earl of Wharncliffe. The station was closed on 7 December 1953. Birdwell Club is a former working men's club located on Sheffield Road. In 2005 it played host to a highly rated gig by local band the Arctic Monkeys, which was voted 9th best gig of the year by the Observer Music Monthly, notably surpassing Live8. The Obelisk. Towards the southern end of Birdwell stands a large obelisk which was constructed in 1775 (according to the plaque) to mark the distance (3 miles) to Wentworth Castle (at nearby Stainborough) built by William Wentworth, 2nd Earl of Strafford (1722–1791). The obelisk was struck by lightning on 6 June 1906. Birdwell has its own primary school and private day-nursery called Chatterbox. Two football teams from the village have played in the FA Cup: Birdwell F.C. and Birdwell Primitive Methodists F.C. The Wednesday and England footballer, Harry Ruddlesdin was born in Birdwell in 1876 and started his football career with Birdwell F.C. Charlie Williams (OBE) lived in Birdwell until his death, in September 2006. Keith Matthewman was born here in 1936. Sylvia Young (founder and Principal of the famous Sylvia Young Theatre School in London) lived in Birdwell as a child evacuee from the capital during the Second World War. ^ "Birdwell Wood" (PDF). South Yorkshire Forest. p. 2. Archived from the original (PDF) on 31 January 2016. Retrieved 9 May 2015. ^ Disused Railway Stations in South Yorkshire: Sheffield Victoria Railway Station, Rotherham Masborough Railway Station. General Books LLC. 2010. ISBN 9781155876252. ^ "The History of Birdwell". Birdwell, Tankersley & Hoyland Common Community Portal. ^ Simpson, Dave (28 July 2005). "Arctic Monkeys, Birdwell Club, Barnsley". London: Guardian Unlimited. Retrieved 26 April 2010. ^ "2005:Gigs of the Year". London: Guardian Unlimited. 18 December 2005. Retrieved 26 April 2010. ^ "Birdwell FC: FA Cup statistics". Wildstat.com. Retrieved 9 May 2015. ^ "Birdwell Primitive Methodists FC: FA Cup statistics". Wildstat.com. Retrieved 9 May 2015. This page was last edited on 7 November 2018, at 11:53 (UTC).